I'm probably the fattest I've ever been now that I've got an desk job. The constant sitting, snacking, and eating out has caused my office chair great distress. It doesn't help that every weekend is packed with family get-togethers where stuffing face is a guarantee. Yesterday my boss and I went to a business lunch to discuss work and how things are going. El Torito isn't a place I would normally go for good Mexican food because the portions are small and the price is on the high end but it's a nice environment for a meeting especially if you are planning to get reamed about work. I didn't feel like a big ol' burrito so I decided to go with my default choice of Chile Relleno. 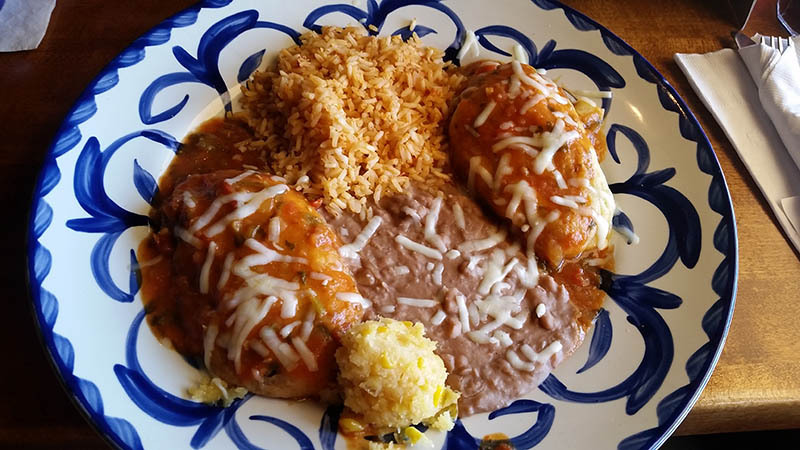 If you're interested in Chile Relleno, you can read about my quest to find the perfect one here. The rice at El Torito is always well seasoned and tasty and the beans are always bland and boring. The Chile Relleno is small. I ordered the Choose 2 Combo and picked both Chile Rellenos. I was fairly disappointed with it but it was a free lunch so I wasn't worked up like I normally would be. The sweet ball of yellow corn cake isn't the same as I remembered either. When I was a fat little kid I would dream of swimming inside a giant ocean of sweet corn cake where the only way to survive was to eat my way out. It was less flavorful than usual and didn't give me those wonderful mild childhood hallucinations that I was craving.